There are variable measurements of this phenomenon, but no real doubt about the basics. A September 2007 Pew survey showed white evangelical Protestants agreeing that abortion should be illegal in all or most cases by a 65-31 magin; Catholics favored keeping abortion legal in all or most cases by a 51-44 margin (with no appreciable difference between Hispanic and non-Hispanic Catholics). On a related issue that helps measure the intensity of anti-abortion views, the same poll showed white evangelicals opposing embryonic stem cell research by 57-31, while white non-Hispanic Catholics favored it by 59-32. Charles Franklin consistently offers great analysis on politics and polling and this chart is a great example. 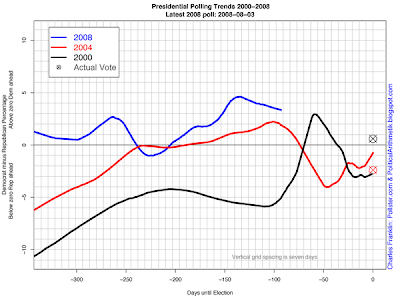 It compares polling in this year's presidential race to the last two races. It shows that Obama is in better shape now than Kerry and Gore were at this point in the race. But it also shows the extreme volatility in all presidential races inthe final months that means that this race really is too close to call. Democrats who want Obama to be elected presidnet can't be complacant: they need to work hard for the victory.